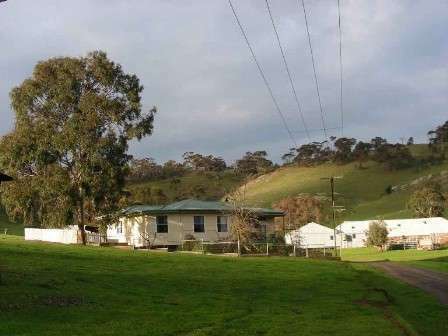 This cottage at Tarlee is a cosy house set in a peaceful and attractive valley on a working farm, 8 kms east of Tarlee in the Lower North of South Australia. 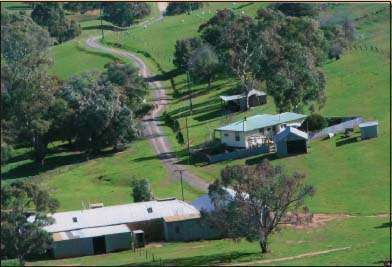 Situated half way between the Barossa Valley and the Clare Valley -famous wine regions. 90 minutes drive from Adelaide. 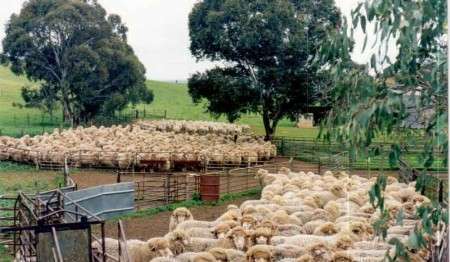 Easy access to beautiful areas of South Australia The chance to experience life on a working farm of cropping and sheep A very moderate tariff. You can email your request for a booking by clicking on 'Enquire Now' below. Alternatively, a phone call or letter is most welcome. The kitchen/living room has fully self contained facilities including an oven; microwave; refrigerator; cutlery and crockery. A dining table and 6 chairs plus two sofas and chairs make a comfortable living area. 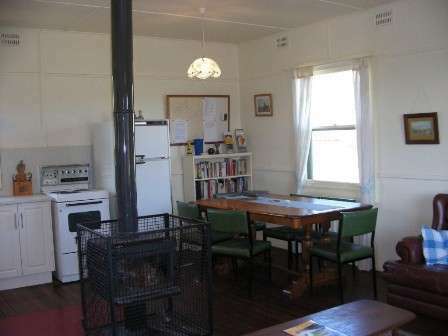 The room has a central wood burning combustion stove for cold winter days; and an airconditioner for the warmer days. A television and radio/cd player provides entertainment.There are three bedrooms, one of which has a double bed. The next bedroom has a double bunk and two single beds, with plenty of play area for children. The third bedroom has two single beds. All beds are supplied with linen, and towels are also supplied to guests. Outside, the garden is fully fenced so is ideal for the safety of small children. As pets are also welcomed to Ryelands, the garden is ideal. The bathroom has a shower over the large bath, and a vanity unit. 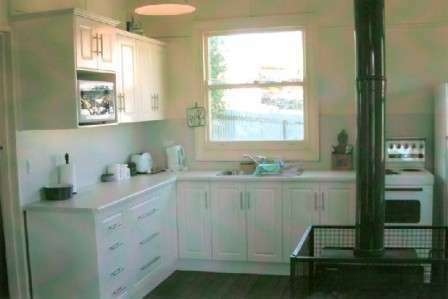 The laundry has an automatic washing machine and a clothes line is attached to the outside of the cottage. Activities...Guests are able to wander around the farm with just a few limits. 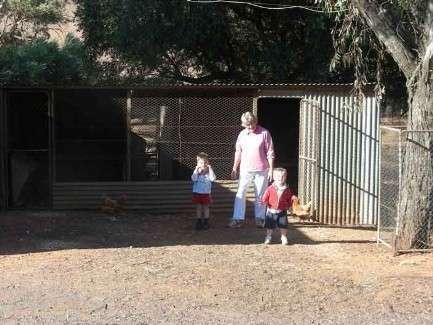 As it is a working farm, supervision of children is essential but on the whole it is a very safe environment. It is a pleasure to watch city children feeling free to run and play with few restrictions. Behind the cottage is a bonfire area which is ideal to use for barbecuing and sitting around during the colder seasons. Its use is restricted to winter because of the danger of fire. 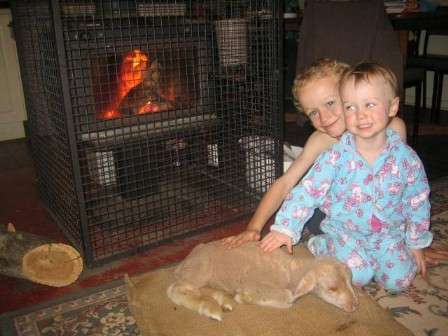 The shearing shed is near the cottage, and unless in use is available as a play area. A table tennis table is set up and bats and balls are available. 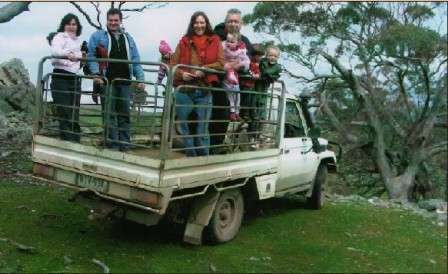 A 4 wheel drive tour is available for guests, which takes them through the hills of the property, finding out about the farming and land care, and watching kangaroos in their natural habitat.